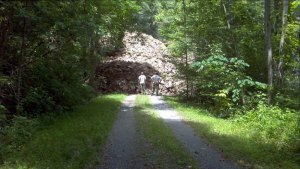 MARLINTON, W.Va. — An 11-mile section of the Greenbrier River Trail is reopening one year after a major landslide during the June 2016 floods made paths in the area impassable. The slip was measured at 300 feet long and 600 feet tall. Following extensive repairs, the section is open again, allowing full access to the 78-mile trail, which stretches from Caldwell to Anthony. “The length of a football field and the height of the New River Gorge Bridge — this earth and rock slide was the Godzilla of landslides,” said Sam England, chief of the Parks and Recreation Section of the Division of Natural Resources. The Greenbrier River Trail is a former railroad, now used by hikers, bikers and horseback riders. Its destruction by natural forces made it eligible for Federal Emergency Management Agency (FEMA) recovery funding. Most of the repairs were done by state park employees and through contractual work with Pineville Paving and Excavating, Inc. of Pineville, and Sibold Excavating of Union. “While remaining work mostly consists of ditch line repair, trail surface repair and a little bit of debris cleanup, the trail is once again passable all the way from Caldwell to Anthony,” England said. Thirty other damaged sites along the trail were identified and addressed, including side trail campsites, culverts and bridges, rest areas, trail washouts and signage losses. The area around the landslide has been contoured to an 800-foot section of trail that now rises to about 18 feet and falls to the original trail grade. Repairs were done in such a way that if another slip occurs, the materials can be moved and recontoured so the trail remains a vital contributor to the local economy. "The Greenbrier River trail is open for business, and it is great news for our tourism,” said Del. George Ambler, R-Greenbrier. “The recent work completed by our DNR team far surpasses the expectations of the repair of the slip. We need to get the word out it is open and get Greenbrier River travelers back on the trail." The state park system acknowledges and is grateful for the support of businesses, employees and volunteers concerned about the recovery of the Greenbrier River Trail.